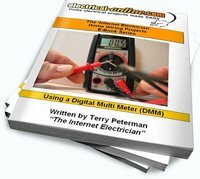 In this informative video, Terry Peterman, the Internet Electrician, demonstrates how to use an electrical meter or tester to troubleshoot a common wiring problem. The situation involves the common practice of replacing an older fixture with a new light fixture. As so often happens, you remove the fixture, strip the wires and when it comes to making the connections, realize that you don’t know which wire goes with what connection. resulting in a tripped breaker, or a light that either stays on or won’t come on at all. How do you figure this mess out? Watch along as Terry, the Internet Electrician, demonstrates the important role an electrical meter or tester plays in safe wiring practices and for troubleshooting situations such as this. This entry was posted in How-To-Videos, Meters & Testers, Troubleshooting, Videos. Bookmark the permalink.